6 Who should consider journalism? Journalism offers the opportunity to spread important information to a wide audience, whilst building a strong and broad network. However the industry is shrinking, so we recommend only pursuing it whilst keeping other options open. • Can spread important information to a large audience and shape public debate and opinion. • Potential to promote effective causes and neglected concerns. • Build a strong and broad network of contacts, which is useful both for advocacy and as a backup for entry to other careers. • Possibility of freelance work, which offers flexible hours and possibility of remote work. • Shrinking industry due to ongoing shift to digital journalism. • Often takes a long time to get a paid position to due high level of competition. • Low salaries, especially at the start of your career. • Fast pace with constant deadlines and long hours. Start writing articles for a blog and try getting pieces published in existing venues. It helps to use your network to get introductions to editors. Afterward apply very widely to jobs. For this profile, we interviewed NPR correspondent David Folkenflik, New Yorker journalist Larissa MacFarquhar and Julia Galef, host of the Rationally Speaking Podcast.1 We also read the coverage of journalism in the Occupational Outlook Handbook of the US Bureau of Labor Statistics, the journalism profiles on Vault, Prospects, Oxford University and Kent University careers services, among other sources. See all our research in our wiki. Journalists report on news through the media to provide reliable information and analysis to the public. Many journalists start off as entry-level reporters who mainly have to stick to the facts when writing stories and don’t get to add much opinion or analysis. Some progress to roles in which there is more freedom to add opinion, perspective and more complex analysis, such as columnists who write opinion pieces and correspondents who cover various locations distant from their main workplace (e.g. the White House) whilst adding their perspective on the news. Senior roles are usually as editors or producers, who co-ordinate the work of other journalists. There are also freelance journalists, who usually write as columnists and commentators on areas they have expertise in, and they often work part-time alongside other jobs. Data from Bureau of Labor Statistics. The industry is currently undergoing a major transformation due to the decline of traditional media like print, radio and television and the rapid increase in news content distributed through digital media. This means that the structure of the career is changing and it’s somewhat unclear what it will look like in the future. Watchdog and investigative journalism has had substantial influence on society, with examples including the exposure of fraud in patent medicines which led to the Pure Food and Drug Act of 1906, the breakup of Standard Oil’s monopoly, the uncovering of the Watergate affair which led to the subsequent resignation of US President Richard Nixon, and the widespread coverage of global surveillance disclosures since 2013. However, there are parts of journalism which do not contribute to the social function of journalism very much, and may even be harmful (see e.g. yellow journalism and clickbait). It is also unclear how much impact a marginal journalist has. Our guess is that it would be better if there were more able and altruistic people in the industry, especially if they use their position to promote effective causes, which we discuss next. An important counterpoint to this is that for much of journalism the incentives strongly favour publishing stories which get a lot of views because this is what drives advertising revenue and is core to the business model of most news organisations. This means that many journalists don’t have a lot of freedom to write about the topics they most want to. However, our impression is that in spite of this, many journalists still have considerable discretion in what they write about, though they may need to spend several years to get to this position. Journalists who work for non-profits, such as ProPublica or publicly funded organisations like NPR and the BBC, get more freedom to write about important issues due to the smaller role that market pressures play in these organisations. And even within for-profit journalism, there are many examples of journalists being able to write about important causes. One example is Vox journalist Dylan Matthews who often writes about basic income, immigration policy and effective giving. All the people we interviewed were using journalism to promote issues they cared about: David Folkenflik wrote Murdoch’s World – a book about the corruption scandal at News Corporation, Larissa MacFarquhar wrote Strangers Drowning – a book about individuals who go to extreme lengths to help others and Julia Galef’s podcast Rationally Speaking grew an audience of around 50,000, helping build a community of people interested in science and rationality. Due to the rise of online publications it is becoming easier to get published, which opens up the opportunity to pursue advocacy journalism part-time, as a freelancer alongside another job that pays the bills. We know of several people who are successfully pursuing this option. Journalists tend to build strong and broad networks through their work. Even a junior journalist with only a few articles in major outlets can get access to a wide range of people for interviews. This can provide a backup and stepping stone for finding other opportunities. Journalists who cover a broad range of topics also get exposure to many different areas of work, which is useful for exploration value. If you work freelance (which you usually do at the beginning of your career) you learn to be independent and develop skills in pitching and selling yourself. If you can get reliable freelance work, you get more freedom to choose which topics you write about and you have more flexibility over when and where you work. Full-time paid positions in journalism are highly competitive due to the large number of people who want them and the shrinking number of positions. In the UK, 47% of newspaper columnists went to Oxbridge and 68% went to a Russell Group university, suggesting that having attended a highly ranked university is important for entry and progression.6 The level of competition means that you often have to spend a long time doing part-time or unpaid work before you can get a paid position. We think that you have a reasonable chance of getting a full-time paid position if you are a relatively able student at a top university and are happy to spend a lot of time writing. We are unclear about the chances of progression within journalism and to what extent it has an ‘up or out’ promotion structure but we suspect that it is very difficult to get to senior positions. We want to do more research on this question. 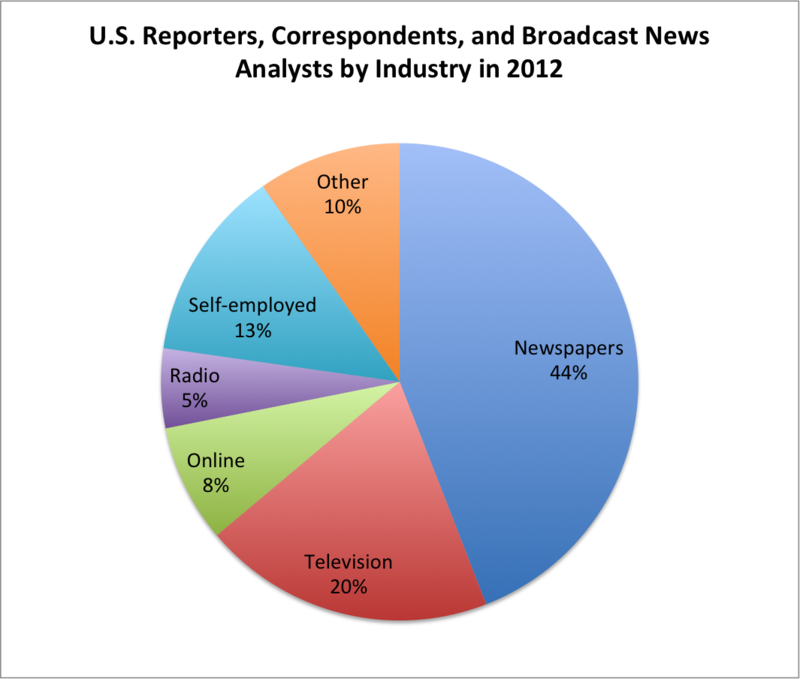 Looking ahead, the US Bureau of Labour Statistics projects that from 2012 to 2022 there will be a 14% decline in the number of reporters and correspondents, a 2% decline for broadcast news analysts and a 2% decline for editors. This is compared to an overall increase of 11% for all occupations. There is a 14% a projected increase for reporters, correspondents and news analysts employed in the digital information industry, but these positions will face fierce competition due to the large overall decrease in the total number of jobs. You can see the projected numbers of jobs across the different industries below. According to Vault the common exit options for reporters are working in public relations, advertising, and preparing copy for radio and television news programs8, which is a relatively narrow range of exit options compared with relevant alternatives, like consulting. For a more optimistic take on the future of journalism, see Wired’s coverage of venture capitalist Marc Andreessen’s views. It’s hard to get paid work early on, and even after you get a full-time paid position the median salaries are relatively low. If your verbal skills and drive are good enough to make it as a journalist, it is likely that you could earn much more in other careers like law, consulting and marketing. Most journalists have a bachelor’s degree and in the UK, 47% of newspaper columnists went to Oxbridge and 68% went to a Russell Group university, suggesting that having attended a highly ranked university is important for entry.10 In addition to a degree, most have experience working for a college newspaper or an internship, or a portfolio of published work. The key skill you need to have is writing stories that get a big audience, plus good speaking skills for working in radio and television, and it helps to be comfortable with interviewing people. If you meet the entry requirements, then if there are issues that you think could benefit from more attention among an audience, and if you can get part-time columnist or commentator work whilst doing something else, then this is a very promising option. Start writing articles part-time to build up a personal library of content you can link to. Then try getting pieces published in existing venues. It helps to use your network to get introductions to editors. Afterward, apply very widely.